Artistic Associate and Dramaturg Jacqueline Lawton recently had a conversation with Pearl Cleage, playwright of Blues for an Alabama Sky, which is being produced by African Continuum Theatre Company. Performances run at the Atlas Performing Arts Center from April 14, 2011 -- May 8, 2011. Here’s part one of our talk. Jacqueline Lawton: So, to begin can you tell me a little bit about where you live (maybe where and what sort of neighborhood)--describe the street where you live--what can you hear if you open a window, what can you see if you look out that window. 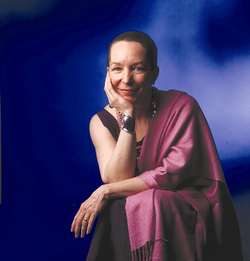 Pearl Cleage: I live in southwest Atlanta, Georgia. My neighborhood is predominantly African American, although, like the rest of America, we are beginning to see more diversity in our community. I live on a busy corner, so there are times when I hear traffic on the street, buses and trucks passing by, school kids getting on or off the school bus. But there are also early morning moments when I hear so many birds singing outside my bedroom window, they wake me up. My home office looks out at a giant magnolia tree that sits smack in the middle of my front lawn and across the street to my neighbor’s wonderfully landscaped yard. She has a number of flowering trees and lots of blooming flowers so the yard is a lovely, ever changing canvas for me to contemplate as I sit at my desk. JL: Next, tell me a little bit about your favorite place to write. Do you write in the same place or in different places? Describe your favorite place. PC: My favorite place to write is at home in my office. I am very disciplined about working every day and my office reflects the projects I’m engaged in at any given time. I write at an old grey metal desk that I’ve had forever that challenged the friendship of several of my male comrades when they were called upon to help me move that desk from one third floor walk up apartment to another. I have a large constantly changing bulletin board, a wonderful black and white photograph of Bob Marley by my friend Bruce Talamon, photographer extraordinaire, and enough grandbaby photos to remind me that there is a life that doesn’t involve the artful arrangement of words on paper. There are also assorted posters on the walls, lots of books, and lots of music. Today, I’m listening to Bob Dylan singing “Buckets of Rain.” Beside my desk is a kerosene stove that my grandfather used to put in the bathroom when my sister and I spent the night at his house so we could take our baths in coziness. At various times, my office also includes my cat, Scatter, who likes to nap in the rocking chair in the corner. PC: I was born in Springfield, Massachusetts, where my father, Rev. Albert B. Cleage, Jr., had a church. We returned to Detroit, Michigan, when I was two years old when his politics made the church elders a little nervous. I grew up on the west side of Detroit (an important distinction for Detroiters) and graduated from the Detroit Public Schools in 1966 with a full scholarship to Howard University, where I majored in Playwriting under Owen Dodson, Ted Shine and Paul Carter Harrison. I came to Atlanta in 1969 and finished college at Spelman in 1971 with a degree in Drama. I grew to love Atlanta – the politics, the people, the contradictions -- and have been here ever since. JL: In addition to writing plays, you are also a fiction writer (WHAT LOOKS LIKE CRAZY ON AN ORDINARY DAY and I WISH I HAD A RED DRESS). When a story or character comes to you, how/when do know if they will live in a play or a novel? Can you speak about your writing process for each medium? What are the similarities? Differences? Finally, do you have a preference for one form over the other? PC: I have written 7 novels, with #8 due in May, but writing plays is where I find my greatest creative satisfaction. Writing is a solitary activity. At some point, you have to stop telling your friends how wonderful the work is going to be and go sit down somewhere by yourself and put those words on paper. With a novel, you write it alone and people experience it alone. With a play, you write it alone, but when it goes into production, you become part of a big, exiting, messy collaboration with artists, directors, designers, actors, producers, and, finally, the audience itself. Once it opens, you are able to experience the piece as part of a group of other people. You can hear what works by the live, human responses around you. When it works the way you hoped it would, there is no better feeling. PC: I’ve been having plays produced since I was in the 4th grade and my teacher allowed me to take my adaptation of “Chicken Little” on a tour of the other classes in my elementary school. I was writer, director, and narrator. We were a hit and I was hooked. JL: Who or what inspires you to write and create theater? PC: I love the immediacy of theatre. I love that it is, I think, one of the most ancient art forms since it began with people sitting around their campfires, telling each other the stories of their tribe. It’s the same today. We come to the theatre, sit down in darkness with our neighbors, and turn our faces to the light so we can hear the story, told out loud by other human beings. In these days when so many people are forgetting how to communicate face to face, eye to eye, heart to heart, I think theatre is a vital part of human culture. PC: I hope that people who experience my work will believe that my characters could actually exist somewhere. The highest compliment I ever receive is when people tell me how “real” the characters are that first struggled to life through my very specific imagination. I hope my plays and my books reflect the complexity of human life, the intricacy of the unending struggle to be a good person, to tell the truth, and to be an instrument of love, peace and understanding!